From prehistoric era all the way to contemporary cultural diversity, anthropologists engage with a wide range of issues and phenomena that affect human life. Anthropology studies human experience, correlating social, cultural, biological, archaeological, and linguistic approaches within a single discipline. 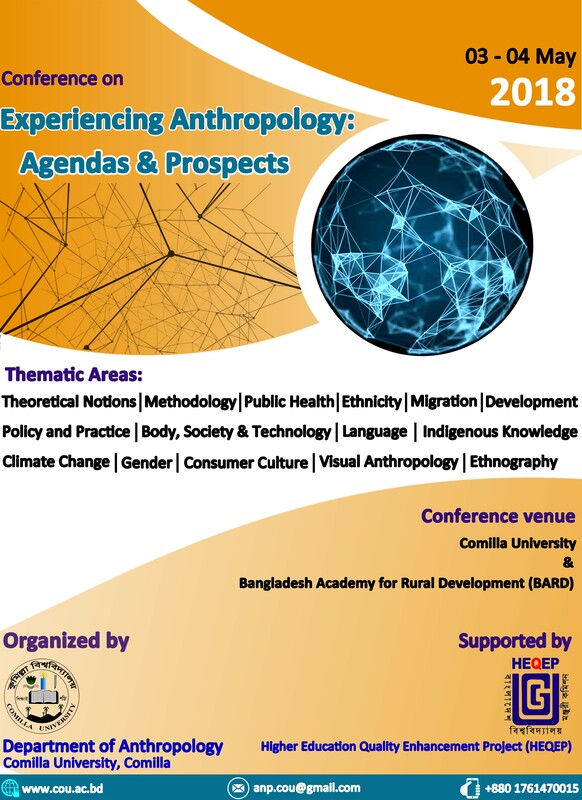 Here we welcome you in this diversified learning journey on behalf of all the faculties, staff, and students of the Department of Anthropology, Comilla University, Comilla, Bangladesh. History of the Department of Anthropology goes back to the decision of the Syndicate of Comilla University (CoU), taken in 2008, to establish the faculty of Social Science. As a follow-up of that decision, the aims and objectives and the detail programs of the proposed Institute were finalized and in 2009 the department was inaugurated. From 2009, it had begun its historical academic journey with admission of the students in B.S.S (Honors) program. The department started its journey with only 35 students in the academic session 2009-2010. Currently, the department is offering four years Bachelor of Social Science (BSS) honors program in Anthropology and a one year Masters of Social Science (MSS) program in Anthropology. Both programs are deliberately designed to keeping a sense of balance between theoretical anthropology and practicing anthropological knowledge in academic and applied sectors. At present, Department has 09 competent (four in higher study) and experienced academics and 02 non-academic staffs with three class rooms, one seminar library, an office room. Total number of students is about 250. Along with producing efficient graduates, this department provides students not only with a strong background in critical thinking, analysis, and writing, but also with first-hand experience through empirical field research. We encourage students to do crosses disciplinary and sub-disciplinary research. Our embrace of both qualitative and scientific research gives our methods flexibility, depth, and analytical rigor. However, the Department continues the trends of extended social research, critical theoretical approaches to contemporary global problems, and historically informed analysis. Department of Anthropology, Comilla University has an enriched associated organization-Anthropology Society. Anthropology Society aims to extend relations among faculties and students beyond classroom activities and sharing. It advocates students to engage themselves in co-curricular activities supported by its four wings. These are like, Language Club of Anthropology (LCA), Debating Club of Anthropology (DCA), Study Circle of Anthropology (SCA) and Cultural Club of Anthropology (CCA). Based on their affiliations with these four wings, students of this department organize different educational and cultural program which envisions their academic journey with the bliss of diversified essence and colors. Emphasizing the core subject matters such as cultural, physical, linguistics and archeological perspectives in studying human beings in anthropology; the department expects to contribute in better understanding of culture, cultural changes, development and urbanization, health issues, environment and ecology, social and behavioral problems, government and authority, policy and planning, education, exclusion and marginalization, contemporary issues and so on. Undoubtedly, the journey with this discipline may help students to be involved professionally in academic, administrative, GO and Non-GO Research and development sectors in Bangladesh as well as all over the world. To focus on the issue of cultural dynamics and address this cultural flows respectively in relevant potential arenas through our trained graduates and post graduates, as we specifically concentrate on the field of cultural Anthropology. to learn and generate new knowledge through research and practice anthropological perspectives to explore human experiences across time and space. We aspire to critically analyze the interactions between culture and human being following an integrated standpoint of theoretical and distinct methodological approaches. Acknowledging and honoring the richness of human culture, in brief, our mission is to appreciate the diversity of human experience differentiated by culture and circumstance and to translate our knowledge to meet social needs for the betterment of human being. With warm greetings, I invite you to learn more about our department and explore ways to connect with us. Anthropology has the ability to capsize accustomed knowledge to question general assumptions and to explain the extraordinary. Anthropology explores the culture, evolution, behavior, beliefs and social organization of peoples around the globe in prehistoric, historic, and contemporary life world. Department of Anthropology of Comilla University, Comilla, Bangladesh is committed to a holistic approach for exploring what it means to be human, including human social and cultural experience, human-environment interactions, linguistic expression, and evolutionary processes from the ancient past to the present.